Here's the beach where your dream vacation begins! Complimentary cook service for 3 meals during a 7-night or more reservation (groceries extra). Shopping service available at $25 delivery charge. 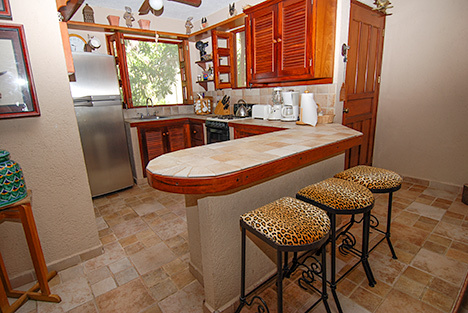 Rates now include cook service for reservations 7 nights or more. Cook service includes preparation, service, and clean up of 3 meals during the week (lunch or dinner). The cost of groceries is additional. Staff can shop for groceries on behalf of the guests. US$25 delivery charge. Here's a vacation rental villa that will charm your socks right off . . . and maybe everything else you're wearing, too! This property has a very private beach area and backyard that's perfect for getting rid of your tan lines. 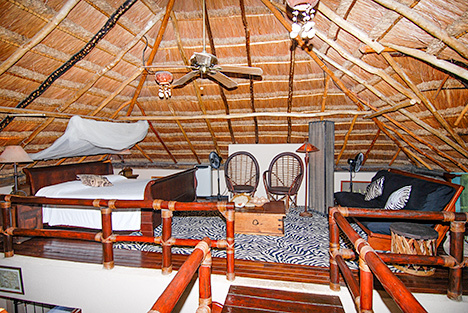 Located on a white sand beach that stretches on and on, Casa Leona (house of the lioness) is full of personality. 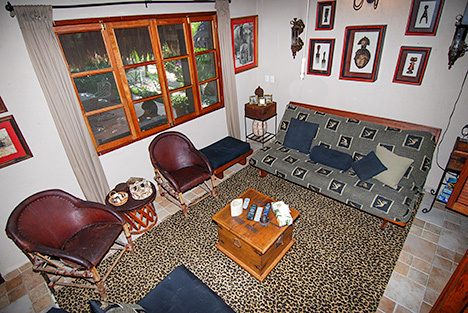 Owners have stylishly decorated the property with a safari theme, using furnishings and art from their travels around the world. 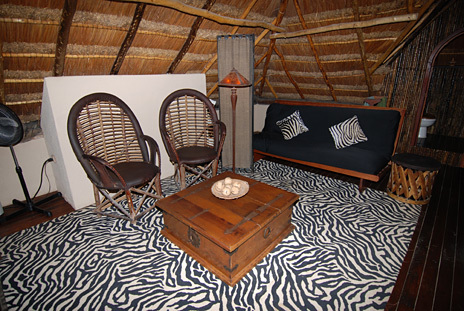 Leopard and zebra print rugs, bar stools with leapard pattern upholstery and photographs taken on an African safari adorn the villa. Sliding glass doors lead to a shaded patio area facing the private backyard and beach area. An attractive cactus garden is located near the patio. 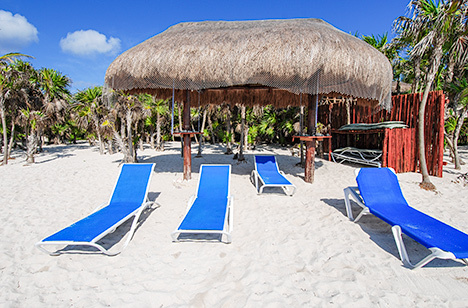 A short stroll through the palm laden backyard takes you to the glorious beach area where a palapa provides shade and has two hammocks for afternoon siestas. 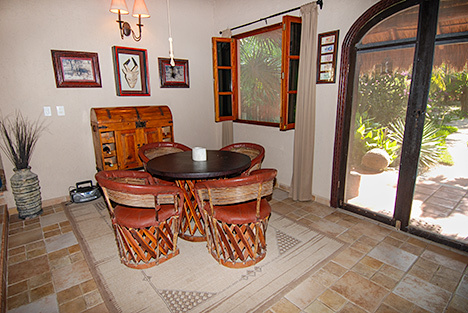 Living room, dining room, full kitchen, one bath and bedroom is located on the main floor. Kitchen has gas refrigerator, small range, toaster, blender and Mr. Coffee. Dining has seating for four plus additional seating at the lunch counter. Bedroom on this level has one queen bed and opens to the living room which has two futons (queen and single). Full bath is located between the kitchen and bedroom. 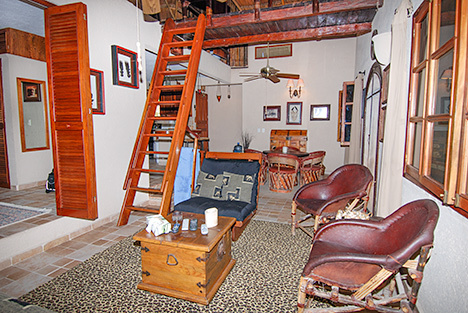 A ladder from the living area leads to the large second level loft where there is a king bed as well as a double futon in upper living area. There is a half bath on this level as well. A walkway leads to an outdoor patio area facing the ocean on this level. 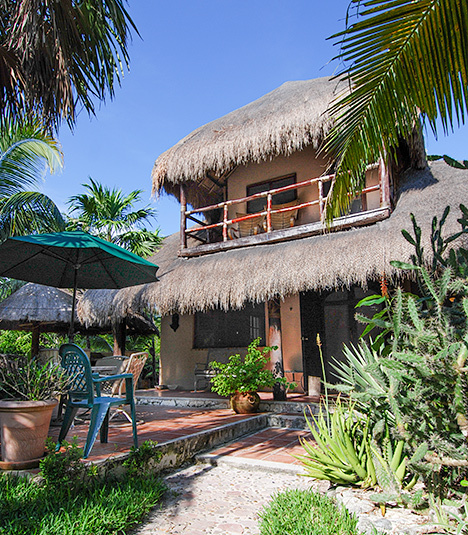 The house has been designed so that there is good air flow and the palapa style roof keeps the villa cool. 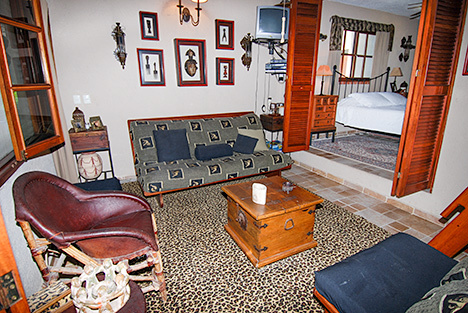 This property is absolutely charming and is perfect for one or two couples or a small family. You'll love the sandy beach and the outdoor living areas. 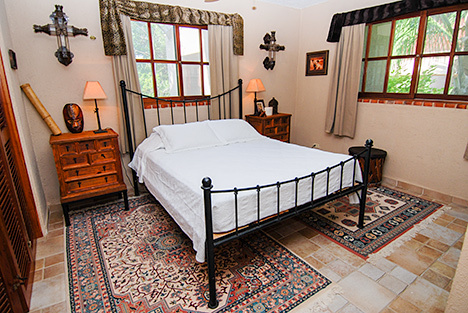 It is a very comfortable property with many personal touches. You'll feel right at home. There is even a TV with VCR and a selection of movies. Bring your favorite CDs, too, because there is a small stereo. With the protective reef about 400 yards offshore, the bay is calm and perfect for snorkeling or kayaking. A kayak is provided for guest use at the property. This is a fun, fun vacation rental property. Relax and never leave the property. Or, just down the road in the Tankah aea is the Manatee Cenote where you can snorkel (maybe you'll see one of those elusive creatives if you're lucky!). 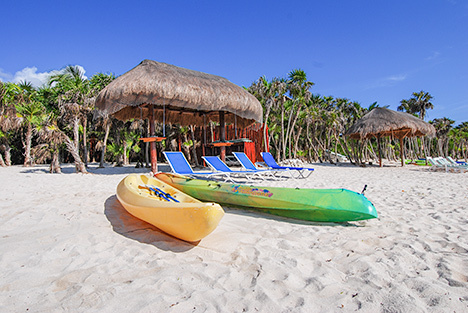 Tulum is south and you won't want to miss the spectacular Mayan ruins built along the cliffs overlooking the ocean. 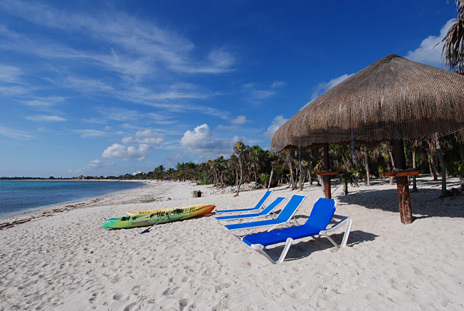 Other nearby attractions include Xcaret, Xel-Ha and Yal Ku Lagoon, all within about a 10-minute drive of Soliman Bay. Restaurants in the area include Oscar y Lalo's in the Soliman Bay area and Casa Cenote in Tankah. Numerous other restaurants are located in Akumal and Tulum. 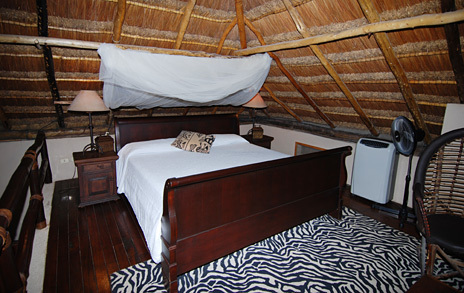 Villa Leona is perfecdt for a special romantic beach getaway.